You will be pleasantly surprised! Our loans are competitive with the local banks and credit unions. We offer many low-interest loans and the process is simple. Gone are the days when you had to fill out pages and pages of financial information. Give us a call or click the button below to get started! Whether you’re shopping for something fresh off the lot or that’s been around the block, understanding how to finance your car is an important part of the purchasing process. Did you know that a payment calculator is just one tool to help you learn more about what you can afford? Maybe you’re willing to take on a higher payment for a shorter period of time. Maybe you’re more comfortable with a lower monthly payment that will take longer to pay off. Regardless, there are ways Mount Airy Chrysler Dodge Jeep RAM FIAT can work with you to get you moving. At Mount Airy Chrysler Dodge Jeep RAM FIAT, we aim to make financing your vehicle something that’s easy to do. Our certified financial advisors are trained to work with any credit situation and leverage a network of hundreds of banks and lenders to secure the best rate for you. Our advisors are kind and considerate. They know that life happens. You shouldn’t be worried or embarrassed about discussing your financial status with our advisors. Helping others work to meet their financial goals is what they were trained to do! Even if your credit score is something to brag about, our lenders may still be able to provide you with benefits you may otherwise not be able to access. Whether you’re thinking of buying this week or next year, we can work with you to make a plan for your next vehicle purchase. Our customers come from Mount Airy and the surrounding communities in North Carolina and Southwest Virginia — Pilot Mountain to Fancy Gap, Roaring Gap to Winston-Salem, Meadows of Dan to Yadkinville — to buy their new cars and trucks as well as shop our great used car and truck inventory. Often you can check your credit score for free through your bank or credit card institution. You also can request a free copy of your credit report from each of the three major credit reporting agencies — Equifax, Experian, and TransUnion — once a year at annualcreditreport.com or by calling 877.322.8228. Once you have an idea of your score, consider what you can do to improve it! Is everything on your report accurate? If not, file a dispute. You should receive a response to your dispute within 30 days. Do you some of the things that hurt a credit score? Are you looking for a new vehicle to replace your old vehicle? At Mount Airy Chrysler Dodge Jeep RAM FIAT we can help you figure out how much your trade in is worth, which will help your buying power. Just use our easy to submit form to provide details about your vehicle and you, and a Mount Airy Chrysler Dodge Jeep RAM FIAT staff member will get in touch with you with an estimate! Before you even come to the dealership, you can apply for financing now. Our online form is secure and collects the information needed to approve a loan amount and interest rate. Mount Airy Chrysler Dodge Jeep RAM FIAT provides offers and incentives that make buying a new car even easier. We offer new car and used car specials and service specials to keep your new ride running smooth. Plus we have programs that provide military cash bonuses, allowances to purchase adaptive or passenger equipment for those with physical challenges, cash allowances for Realtors, home builders, women business owners, and members of the snow and ice management association. Need a commercial vehicle? Check out RAM’s $500 On The Job bonus cash offer. Search our online inventory at clickmountairy.com, give us a call at 336.429.5462, or come visit us at 538 N. Andy Griffith Pkwy, Mount Airy, N.C. 27030. Our sales department is open from 9 a.m. to 8 p.m. Monday through Saturday, and our financing experts are here to help you every step of the way. 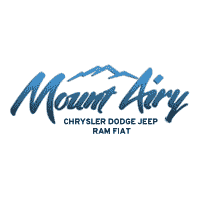 At Mount Airy Chrysler Dodge Jeep Ram FIAT, we offer competitive financing rates and terms on our great selection of new and used trucks, cars, and SUVs. Our finance experts are here to guide you through the financing process and help you get into your new vehicle. Contact Mount Airy Chrysler Dodge Jeep Ram FIAT’s finance team today or if you’re ready to start the financing process, you can fill out our secure finance application online.